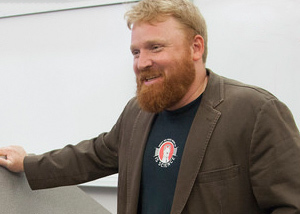 Jesse Driscoll, an assistant professor at the UC San Diego School of Global Policy and Strategy, received the 2016 Central Eurasian Studies Society (CESS) Book Award for his research monograph, “Warlords and Coalition Politics in Post-Soviet States” (2015). The award is bestowed to the author of a work representing the most important contributions to Central Eurasian studies, or a work that holds the greatest potential for furthering scholarship on the Central Eurasian region, and is awarded every other year to a book in the social sciences. We connected with Driscoll for an inside look at the making of his award-winning tome and to understand the importance of the accolade to him. What does this award mean to you in that it was bestowed by CESS? Given this also is the first book you’ve ever published, in what way does that heighten the significance of this honor? For how long was “Warlords and Coalition Politics in Post-Soviet States” in the making and from where does its content stem? What led to your initial interest in Central Asia? What was the fieldwork that served as a springboard for your book? “Well, at the time I conducted initial fieldwork, U.S.-Russia relations were quite good. Certainly, both countries agreed on the nature of the threat we were facing with respect to Islamic fundamentalism in Central Asia. At this time the U.S. was attempting to stabilize Afghanistan. Right across the border was Tajikistan, which had fought a brutal a civil war about a decade earlier. I wanted to go to Tajikistan to learn more about how the Russians had solved problems that looked superficially similar to the problems America was facing in Afghanistan. That’s how I talked myself into the project at the early stages, anyway. In your eyes, what has been the real-world impact of this book, or what do you envision the real-world impact being? “(Laughs) The honest answer is that I won’t know for a while. That’s what I meant before when I said that writing a book is a long game. Most academic books don’t have any real-world impact at all, if you define ‘real-world impact’ as policy impact. What you really want to do is subtly change the conversation among the next generation of graduate students. On the other hand, there are a couple of tangible impacts I can point to. When the U.S. State Department appointed a new ambassador to Tajikistan last year, I was flown out to brief her. That type of opportunity provides more potential to make a policy impact than most political scientists have. What’s next for you as an award-winning author?